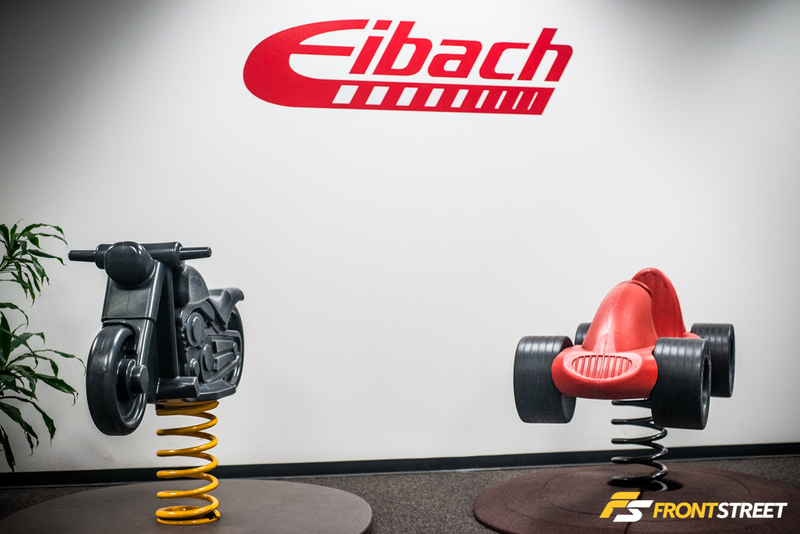 Hopefully everyone caught our Facility Tour: Eibach Suspension – Part 1 where we went over the steps involved to create Eibach’s spring and Anti-Roll Bar systems. 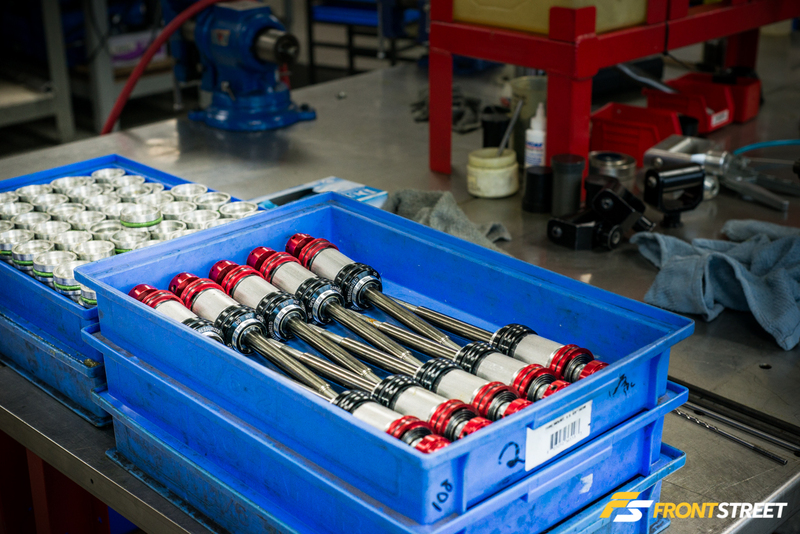 We’ll pick up Part 2 with the remainder of the facility tour including the production process for all of their shock/strut/coilovers. Walking into their California facility located in the city of Corona, I was pleasantly welcomed by the front desk. But immediately then distracted by an extremely clean Acura Integra Type R. The roll cage caught my eye through the front of the car, and its plethora of race parts kept me looking over the entire body. The car was swapped with a K-series engine during their annual Honda meet back in 2013, as a display of technological know-how and entertainment throughout the day. 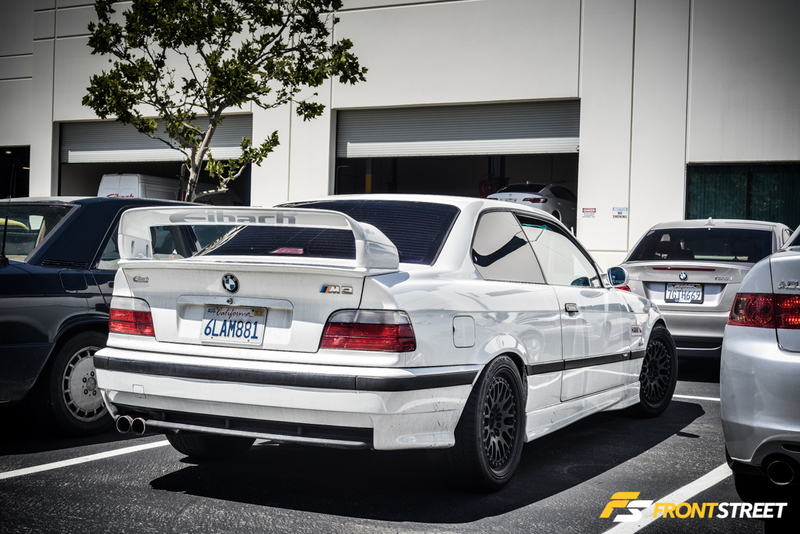 Wearing its Eibach number plate, the car has now become a showpiece in the lobby. 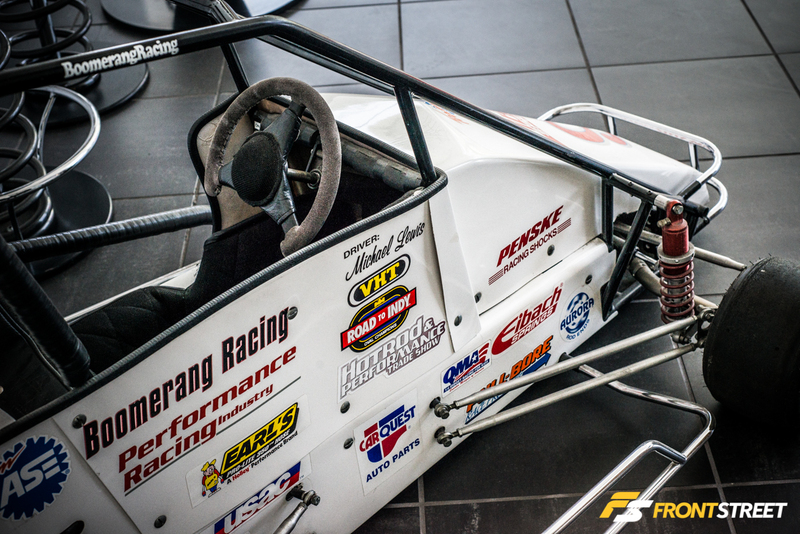 A driver local to their area, Michael Lewis’ quarter midget racecar sits adjacent to the Integra. This racecar using Eibach suspension pushed him to win many races, pole positions, and fastest laps up until 2005. 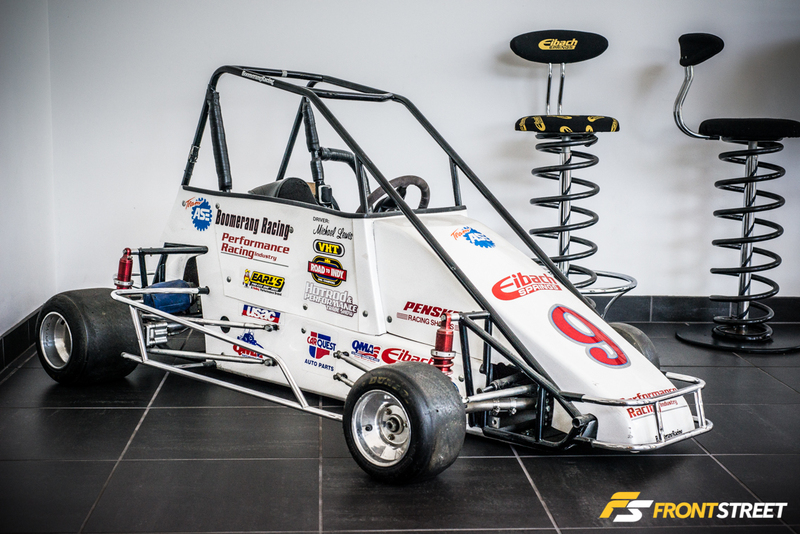 Now a part of Porsche Motorsport’s young driver program and racing in the Pirelli World Challenge Series, the quarter midget shows the progression of the driver, and Eibach’s influence on his career from an early age. To continue the tour, we began down a hallway where the engineers work out all of the mathematical formulas needed to morph the wound steel into the parts needed. 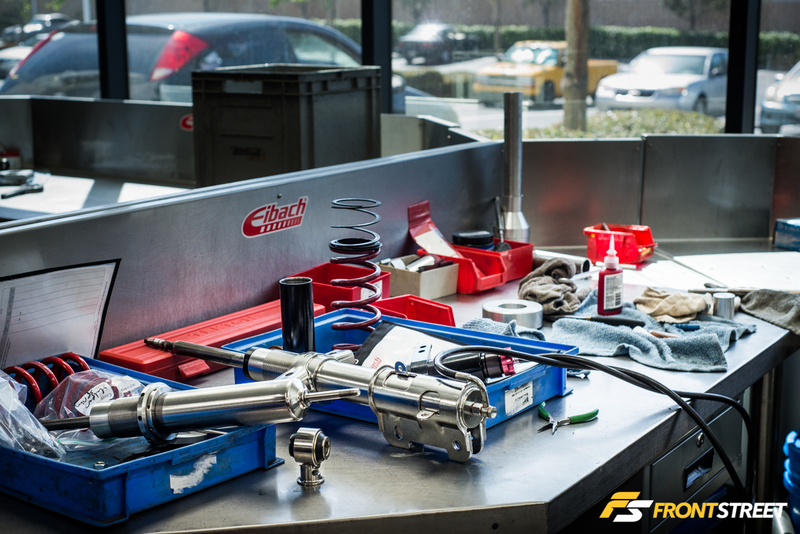 Moving into the workshop, the technician was working on test fitting suspension setups on several different cars. 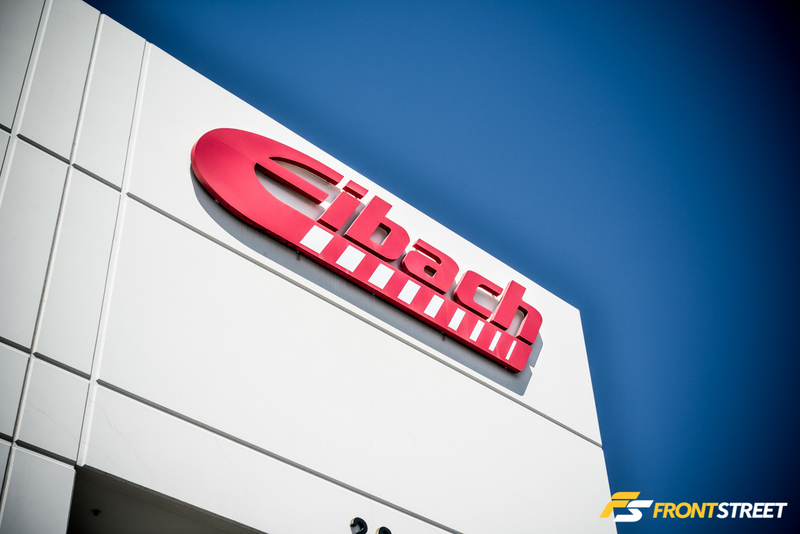 Eibach runs a program “Eibach Wants Your Vehicle!” for various applications if you have the ability to leave them your car (or truck) for test fitting. 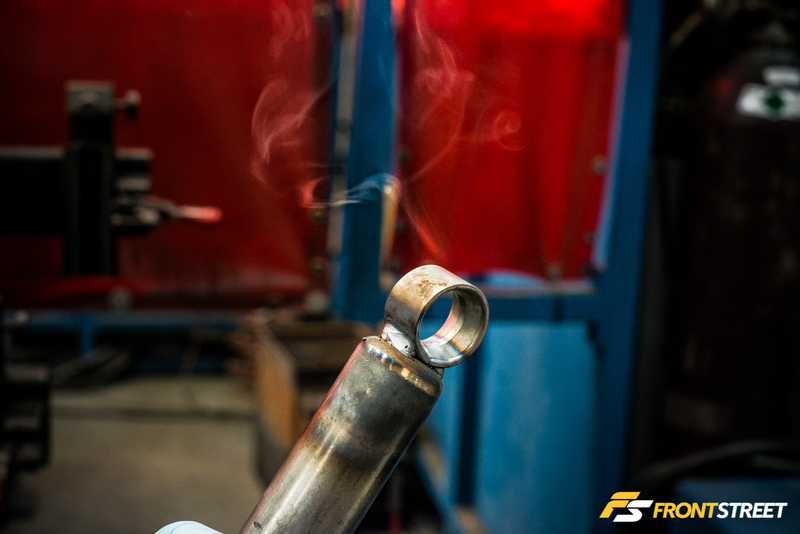 They design, create, modify, adjust, and test their newest suspension products on your personal car. Ready for the best part? You get to keep whatever components they installed, free of charge! 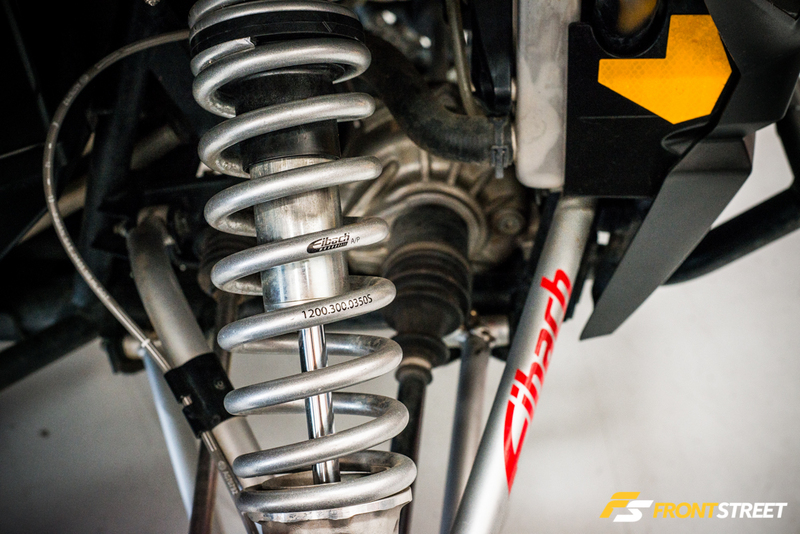 Most recently Eibach has taken on the UTV market, this Polaris RZR was used for testing multiple new spring packages that are in production now. 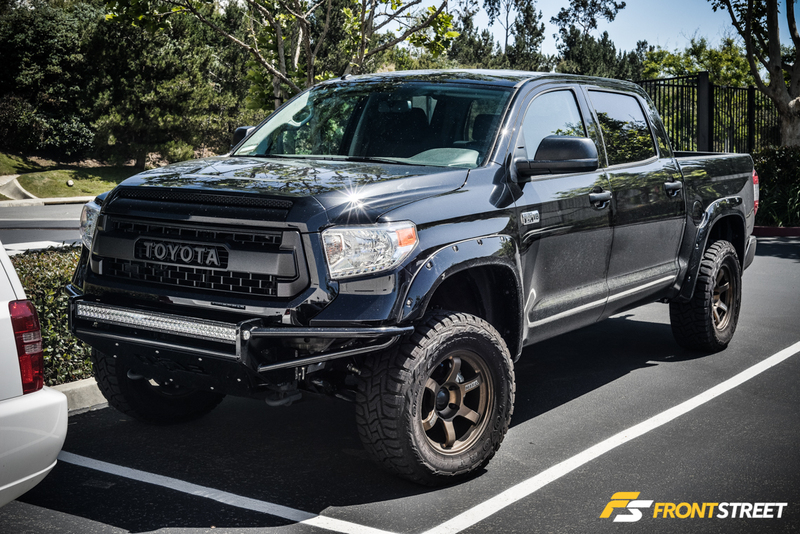 This signified the constant forward movement of this company, and their desire to create performance suspension no matter the application. 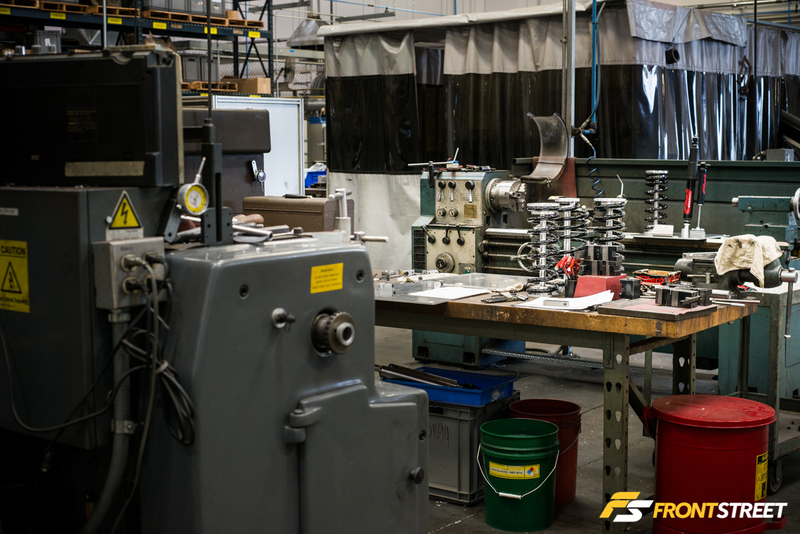 The small room in the back of the workshop houses the numerous torture test machines for their products. Including a machine meant to twist sway bars, a salt sprayer, and this spring tester. 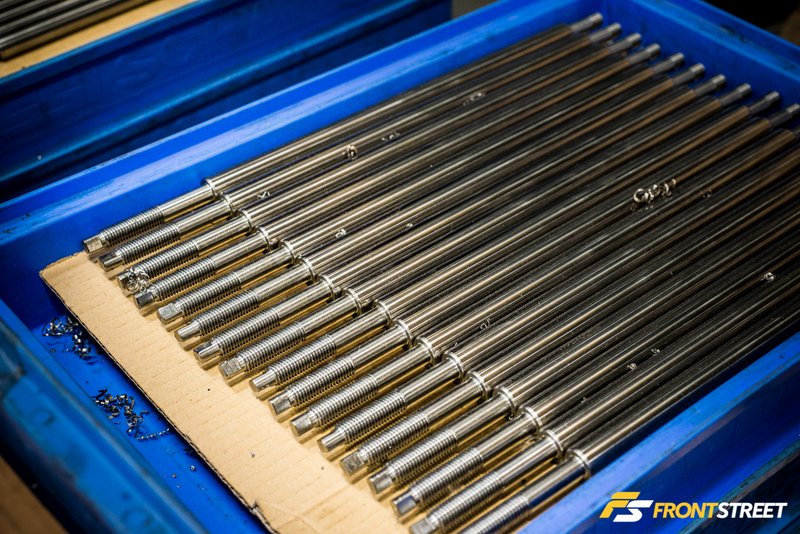 This will cycle springs up to 500,000 times at various speeds and compression ranges. This mimics the most extreme conditions and ensures the spring will endure throughout its life. The loudest mechanism in this room is their valve spring test mule. This V8 is actually heard throughout the entire building when running, because of the open exhaust ports and amount of time it needs to be running to fully test the products inside. Leaving the workshop area, and entering the manufacturing warehouse you immediately notice the differing pace. 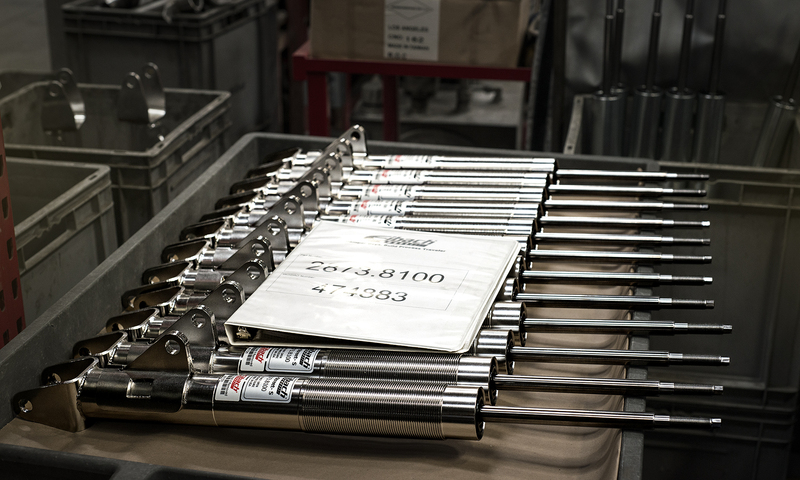 Out here the key is shock/strut production runs, and completing them on time. 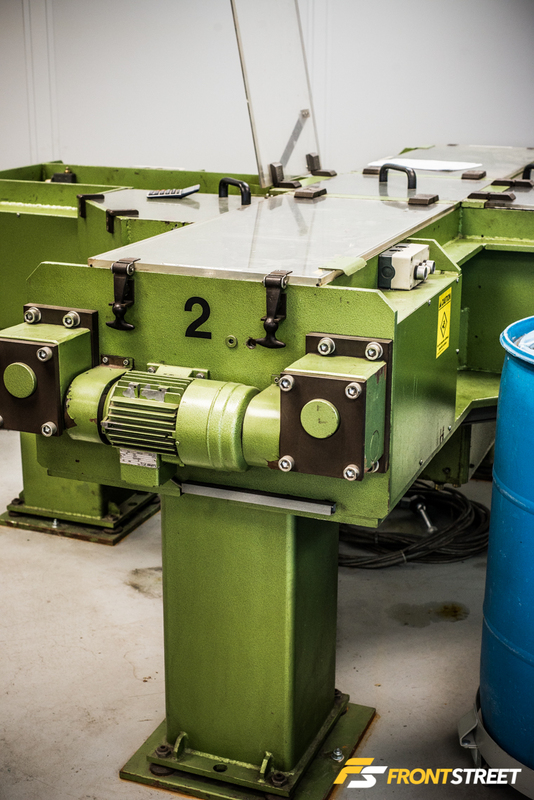 This large band saw is used to slice the raw steel piping into appropriate lengths for shock bodies. Which are then heated to have their edges rolled smooth. 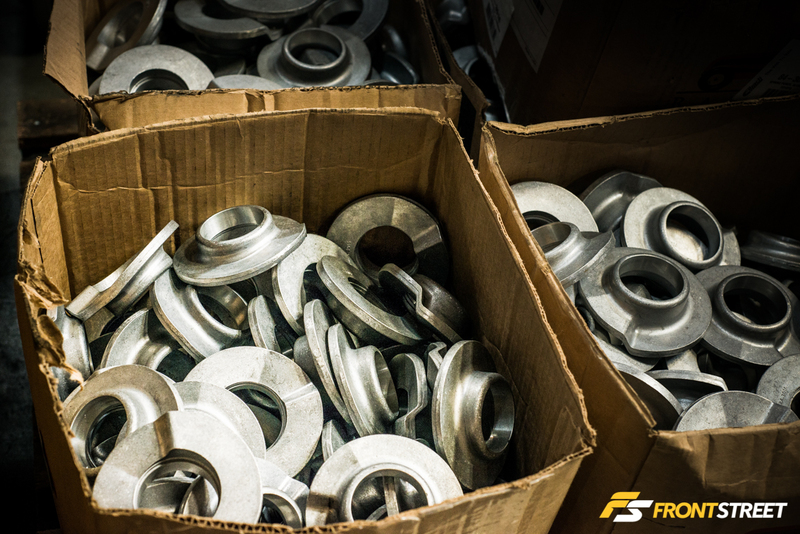 On certain applications an eyelet is needed on the end to house a bushing for mounting purposes. 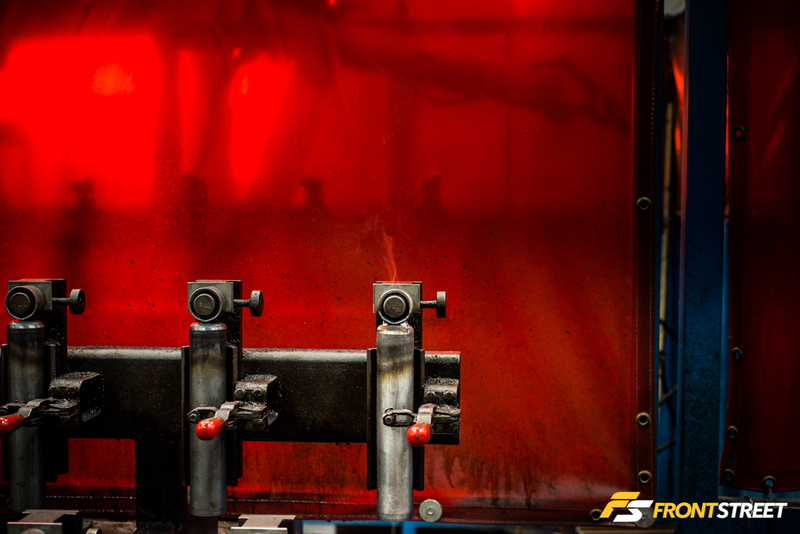 The robotic welder looming behind the red curtain seals the fate for these unsuspecting steel tubes. 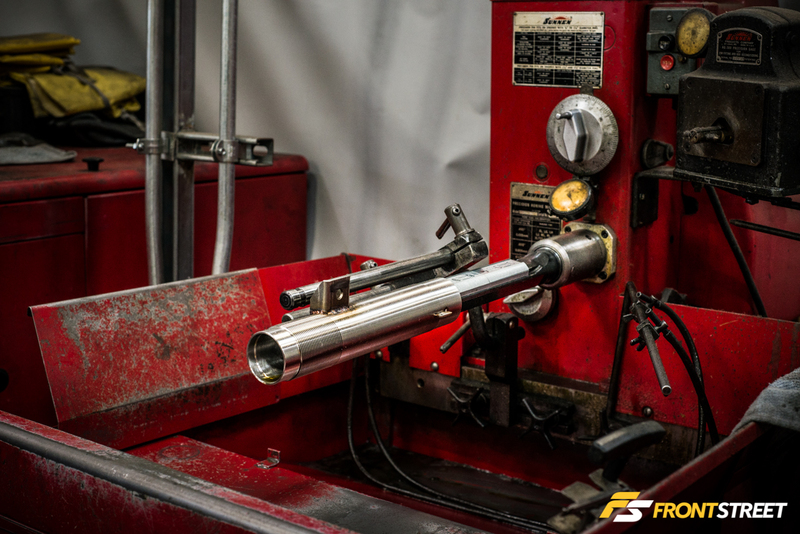 The threaded shock bodies for their coilover setups are also machined in house then honed, just like an engine, for the proper inner surface before assembly. 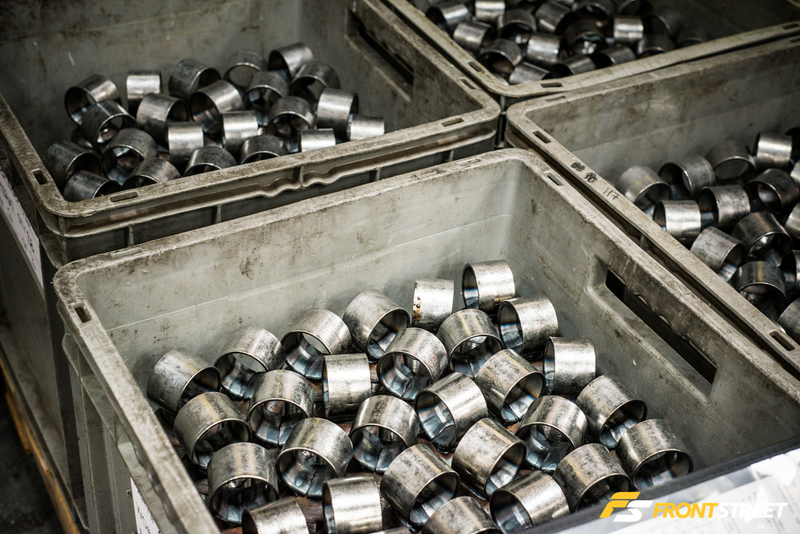 Throughout this area you’ll find completed bins of many different pieces, just waiting for the next step of production. 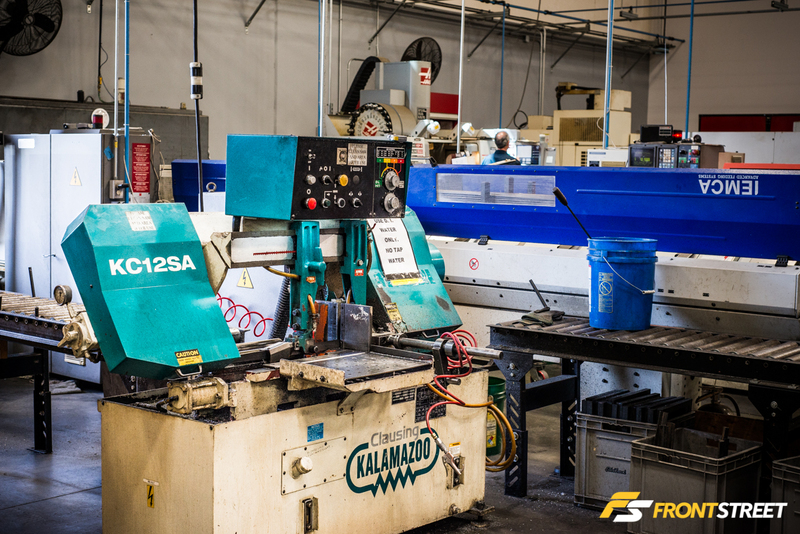 Smaller machines in this area allow for prototype and development parts to be made without interrupting the production process. 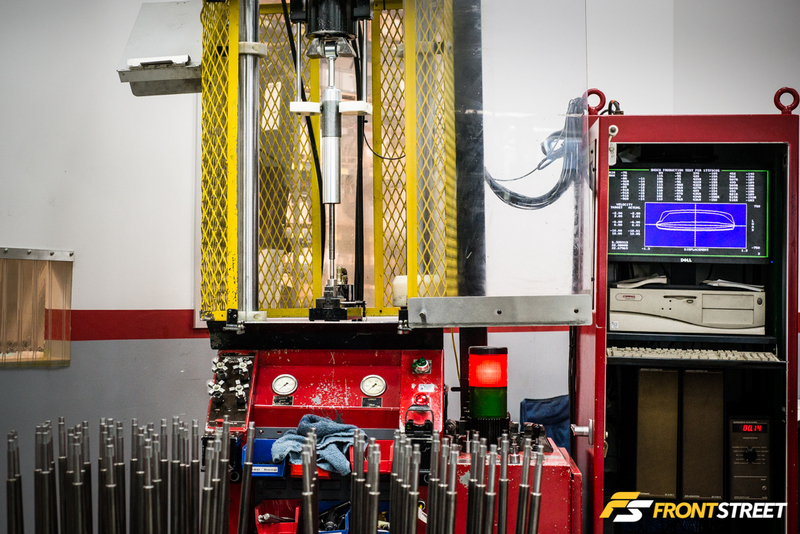 It is also used for the creation of their spring and shock display pieces. The next room is similar to the torture testing but in a much more civilized manner. 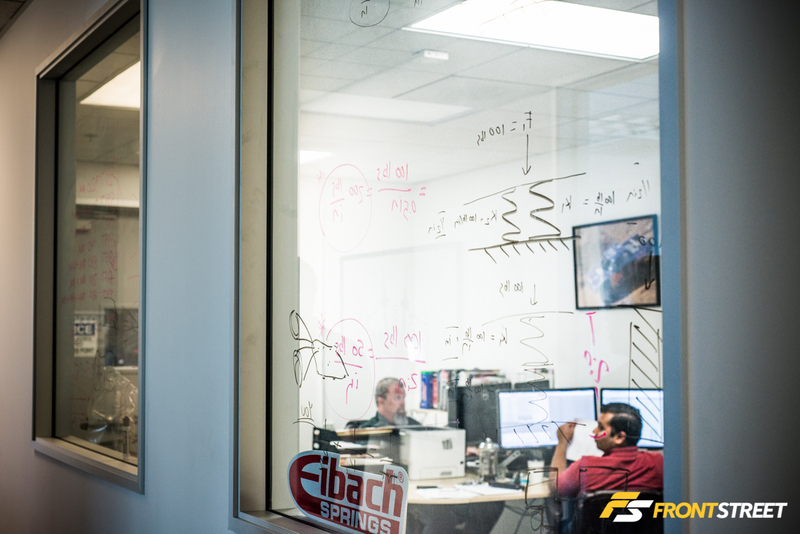 This telemetry room is used to measure and record all the statistics that make their products so well known for quality. 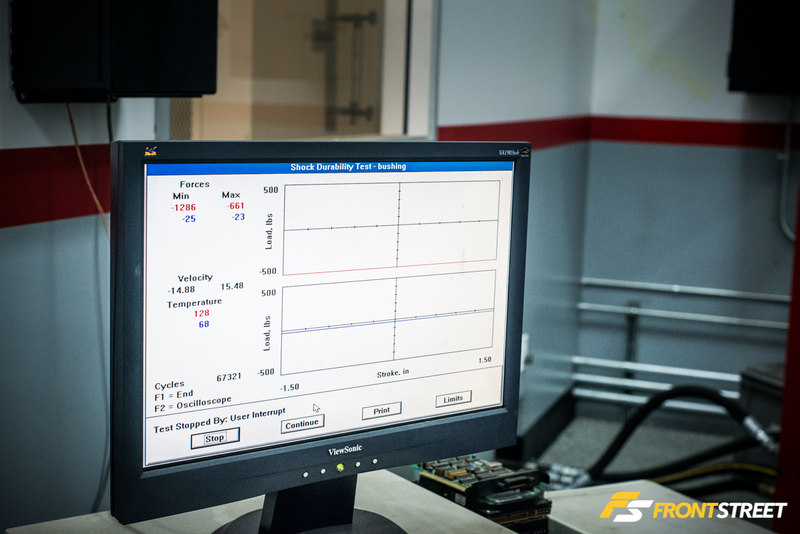 Pictured here is the shock durability test machine. 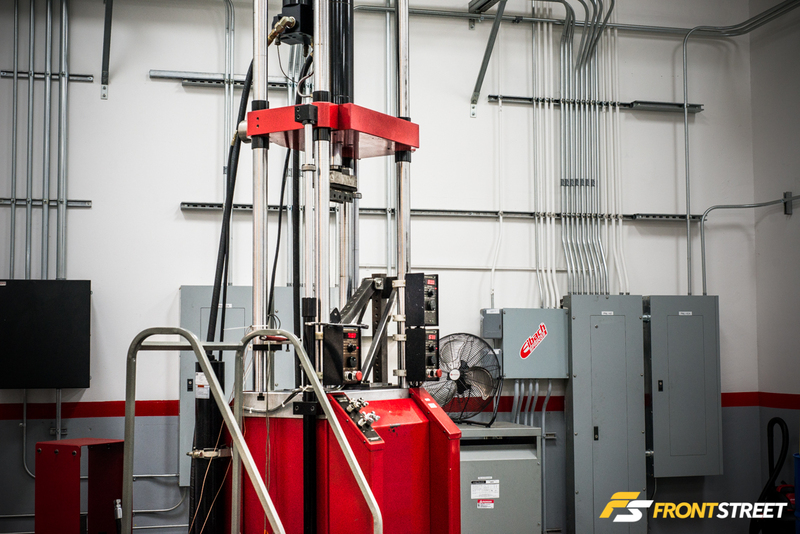 This massive machine can test dampers alone, or with springs at different frequencies. Tests can range from 5 minutes, to 2 weeks without stopping. 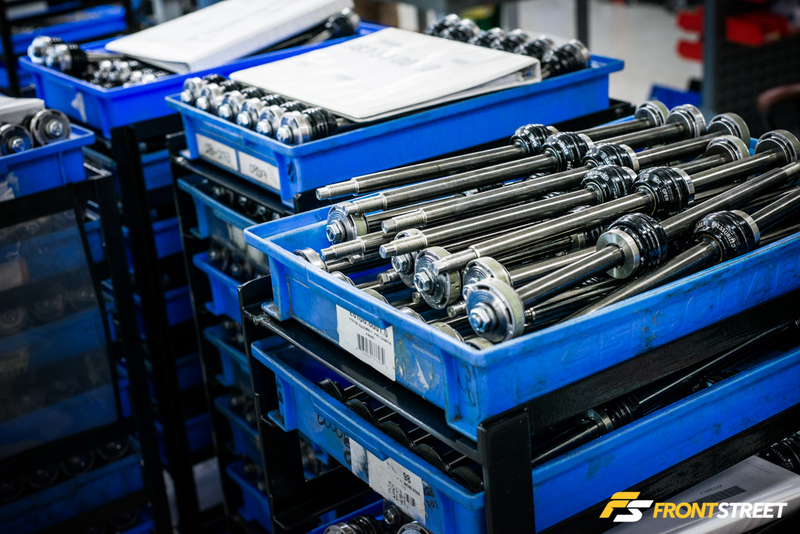 This Blue machine is used for the Eibach Pro-Dampers (not coilovers) once a shock body and piston assembly are inserted. 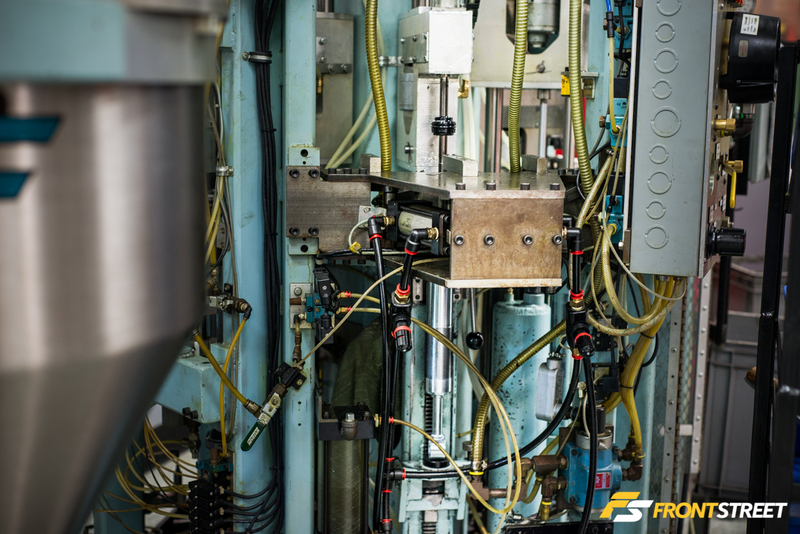 The machine will seal the housing and fill the damper with oil and gas. Once removed it is moved to dyno testing. 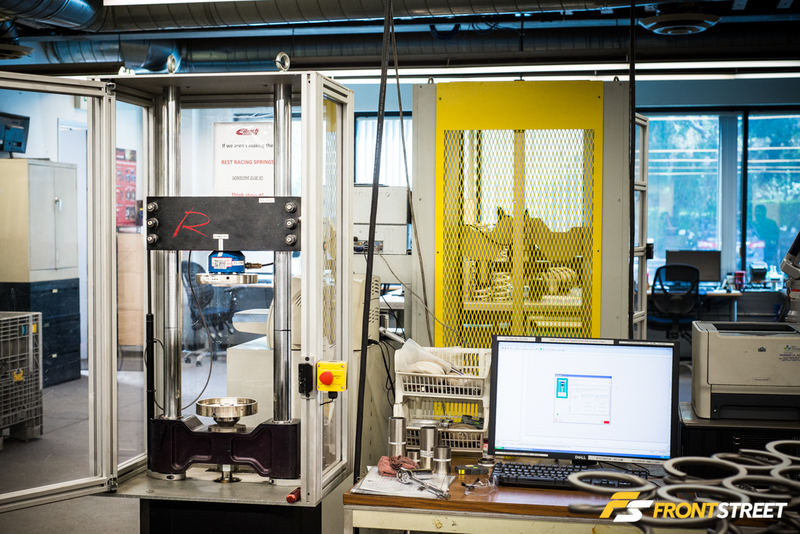 This shock Dyno tests all items from the previous machine. 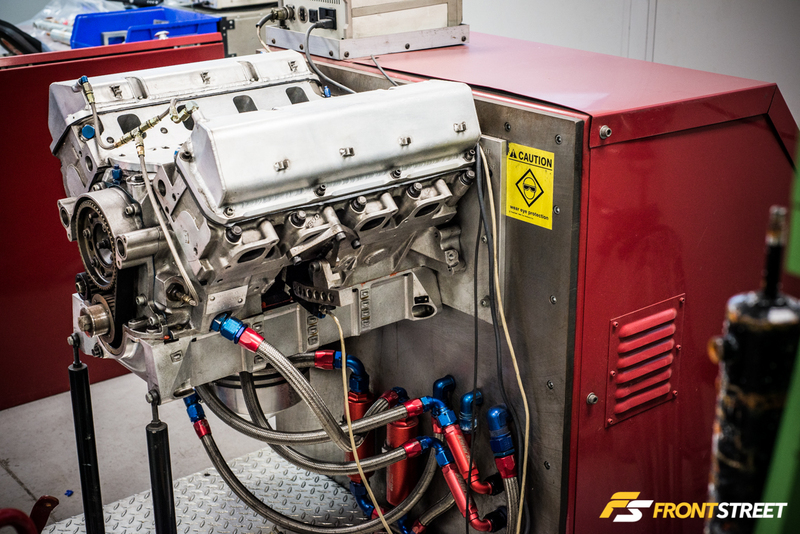 Depending on what dampers are being produced, this dyno will be setup to test for specific readings. 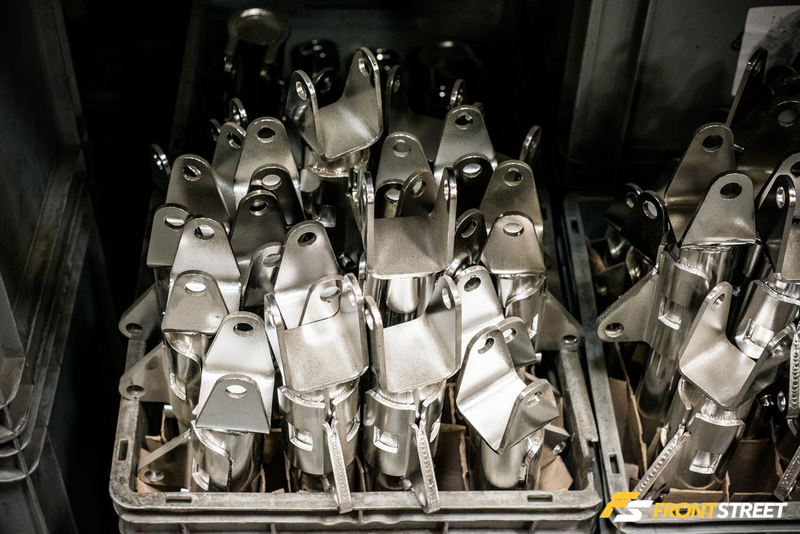 Once the part passes the test it will be moved to the next stage of production. 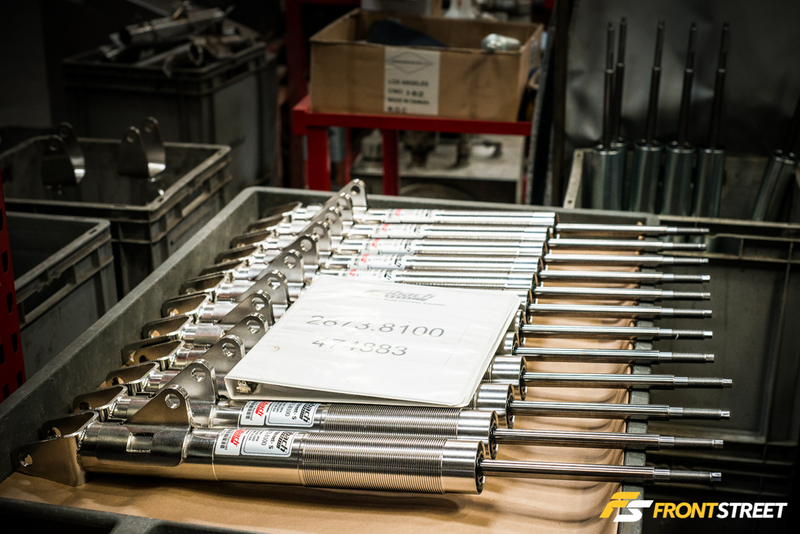 All of their adjustable coilovers are assembled in-house by hand. 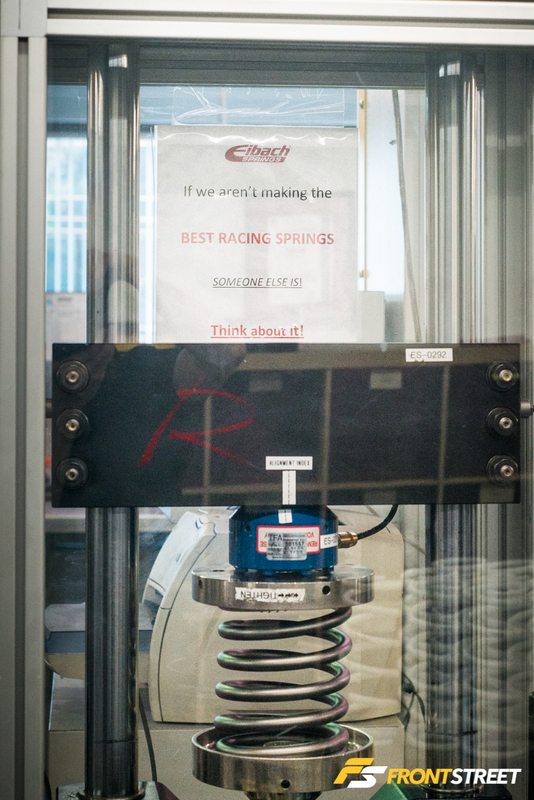 The only machine used is the Roehrig shock dyno that will confirm if the item passes. 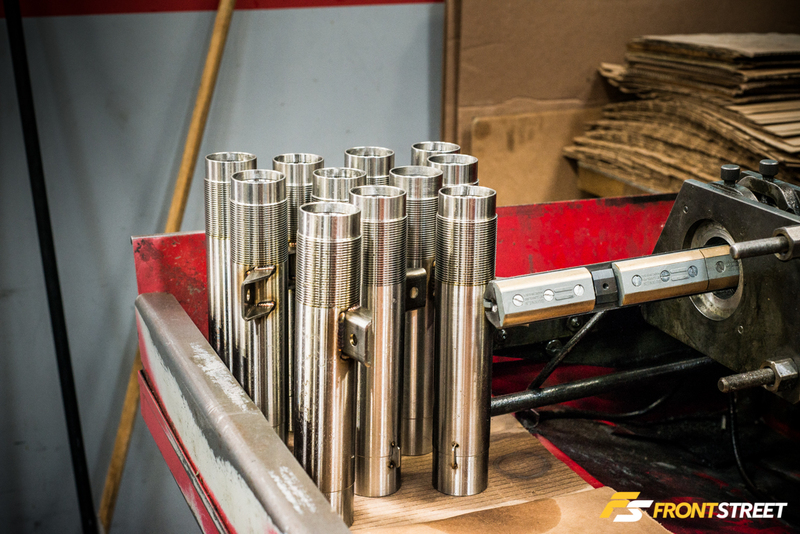 On any given day you can find a few application specific pistons/valves waiting to be put into shock bodies. 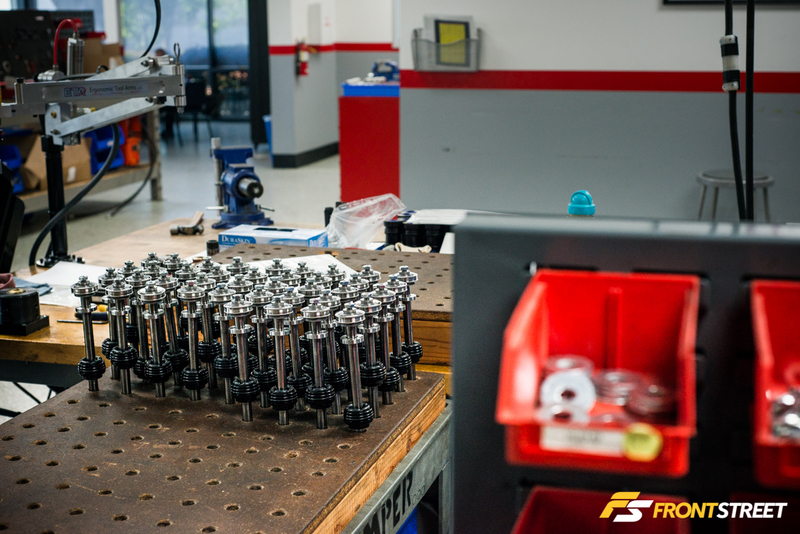 Here is one of the many assembly/rebuild stations on location where the technician treats the product to a fresh set of components whether it be, a paid rebuild, or the initial prototype of a new damper. Boxes/bins full of components and finished product litter the shelves and area surrounding the production room. The NASCAR springs from Part 1 now sit in the quality control room seen here. These are a spec spring for the Super Speedway races. Because every car on grid must use one of these springs, it is crucial that they are all the exact same. 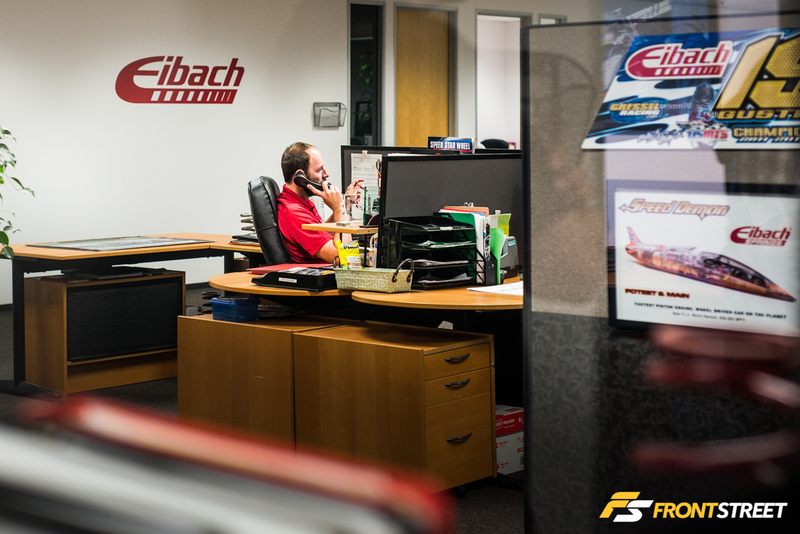 These are so closely regulated; Eibach labels each spring with scan able barcode. 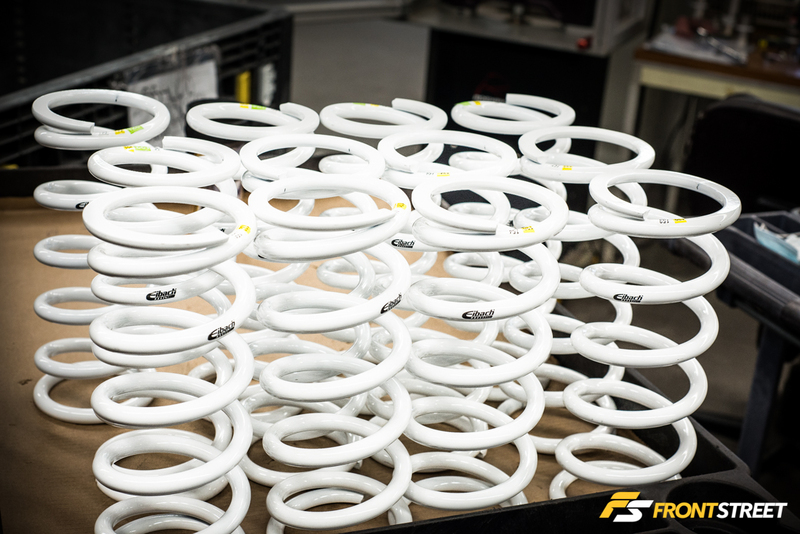 Every spring is tested multiple times before shipping. Once shipped to the NASCAR officials, they will be retested before they are distributed to the teams at random. If needed the barcode can be scanned and all test results for that spring will be shown. 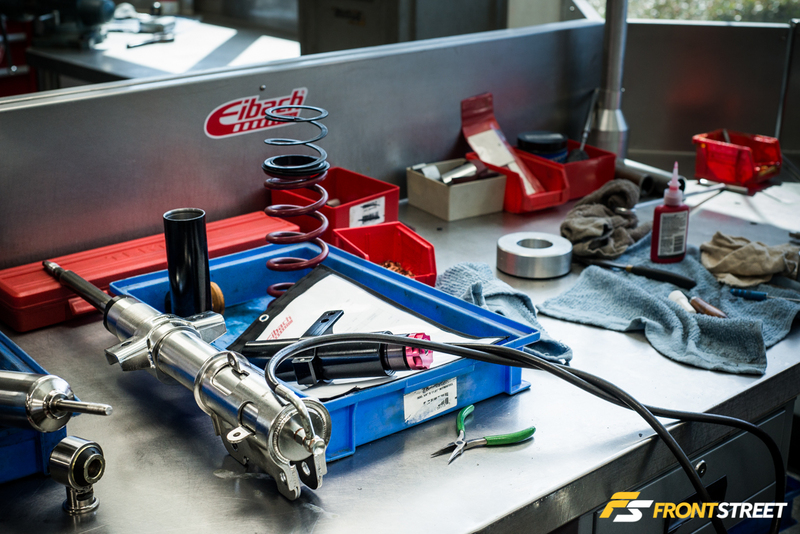 In some cases the springs are then returned to Eibach so they can gather crucial data after race use. This helps to further their development process. 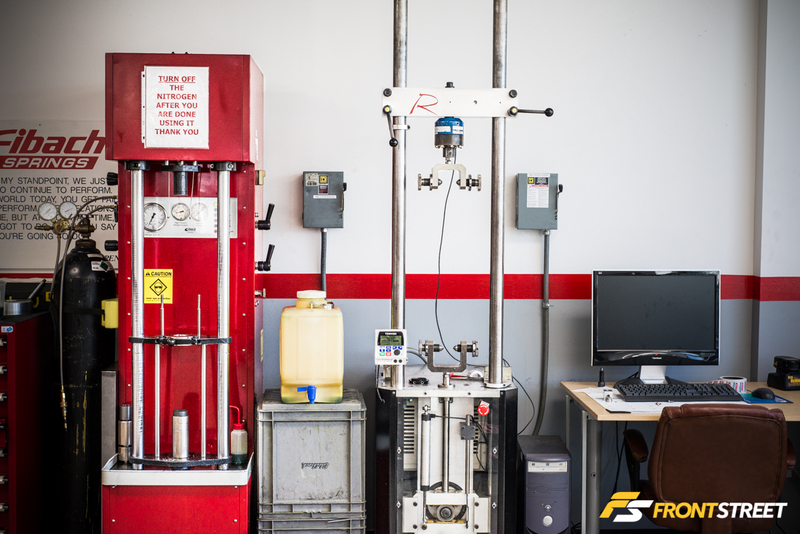 This spring dyno testing machine ensures the spring rates match correctly to their spec sheet. 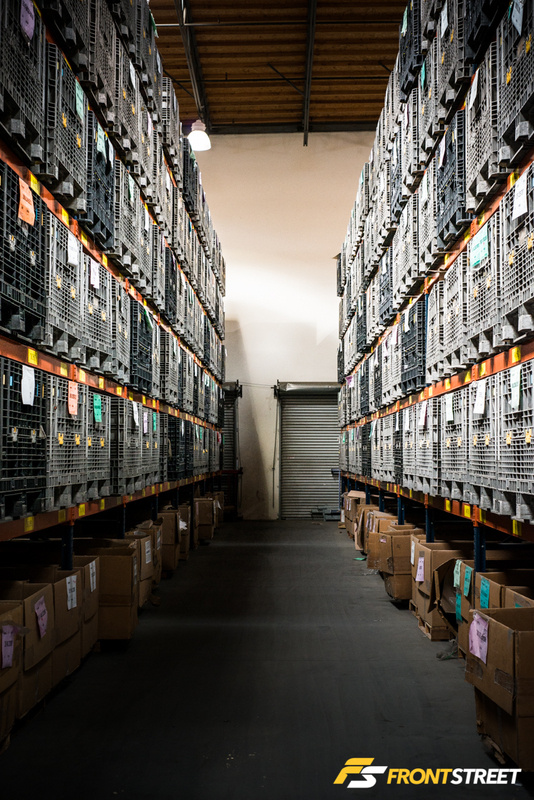 Moving into another portion of the building we’re greeted by stacked aisles filled with large tubs on the shelf. 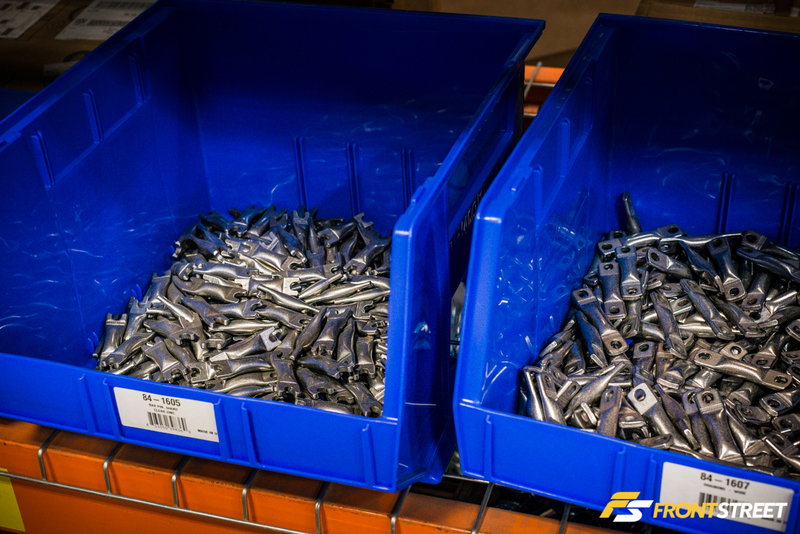 These are full of single runs of a part number. 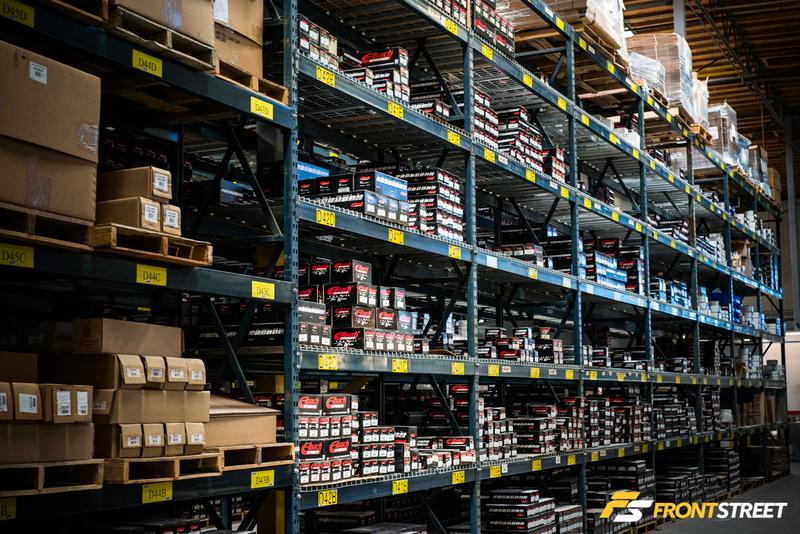 Because many springs can be used in multiple applications, this allows Eibach to hold more inventory, and assemble the kits as needed. They also keep their stock of finished product on site for any direct retail sales, or drop ship and wholesale orders. 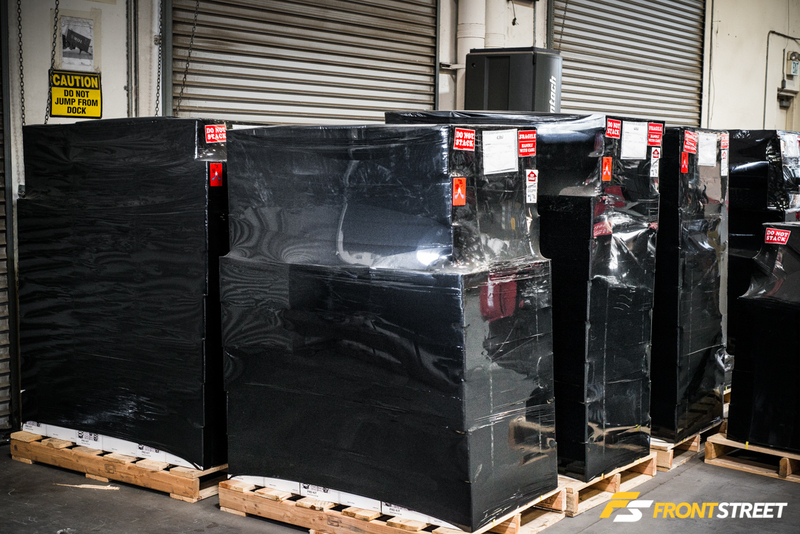 Getting their pallets ready for shipment is done by way of this machine, which winds their protective black plastic wrap very tightly. This will prevent any items from becoming dislodged from the shipment, and display any tampering that may happen during transportation. The total number of North American sales reps is smaller in number than you’d expect, with only a few people handling all of their clients. 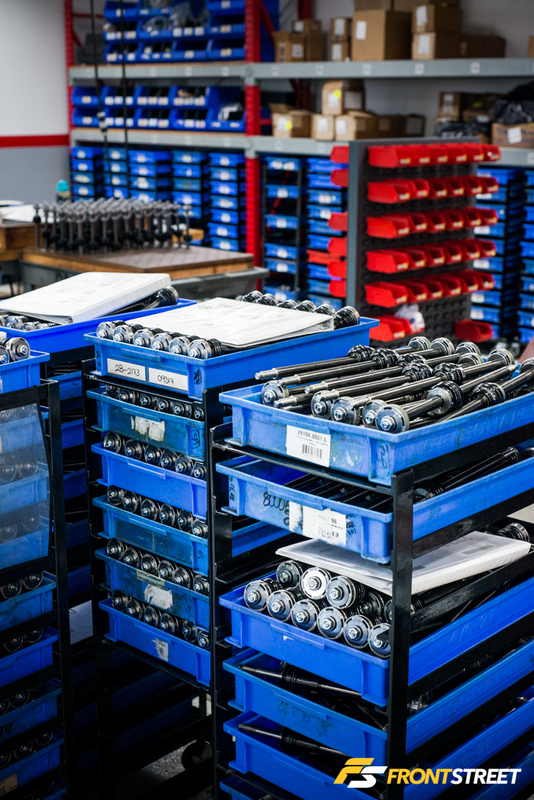 Keeping with the family-owned atmosphere, the overall number of employees at their North American facility in California is just over 100 people, most of which are in the production departments and warehouse. 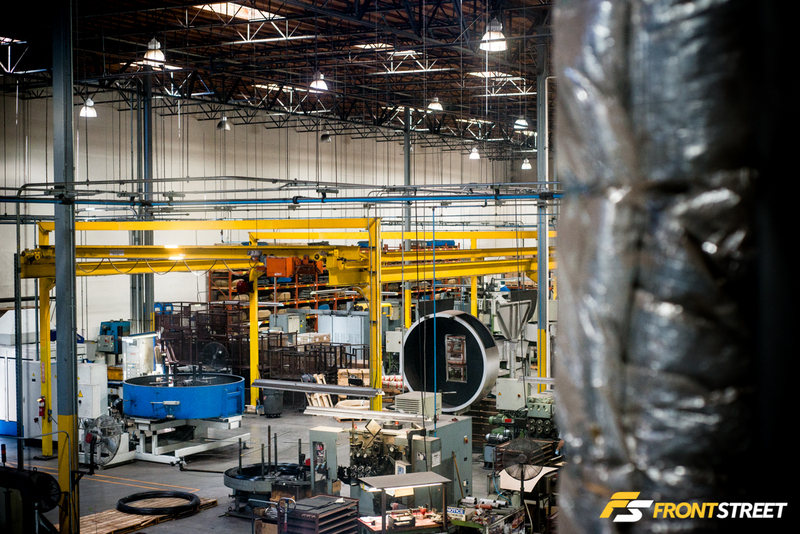 The office windows provide a bird’s eye view of operations down inside the manufacturing side of the warehouse. The outside parking lot had a bunch of modified employee cars and trucks. Most of which have been used for R&D testing at some point. The owner, Wilfried Eibach, happened to be on site that day, and I spent a few minutes talking with him, with no knowledge his name was on the building. Also, I later learned the Cherokee pictured here is his form of transportation when he’s in the U.S. He is such a Jeep fan that he also drives a Cherokee when he is home in Germany. 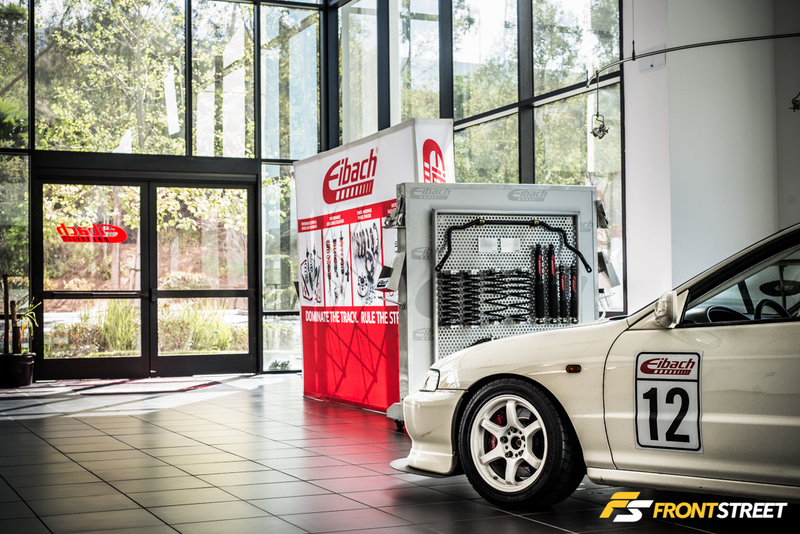 In all, I gained such a strong respect for Eibach from this tour. 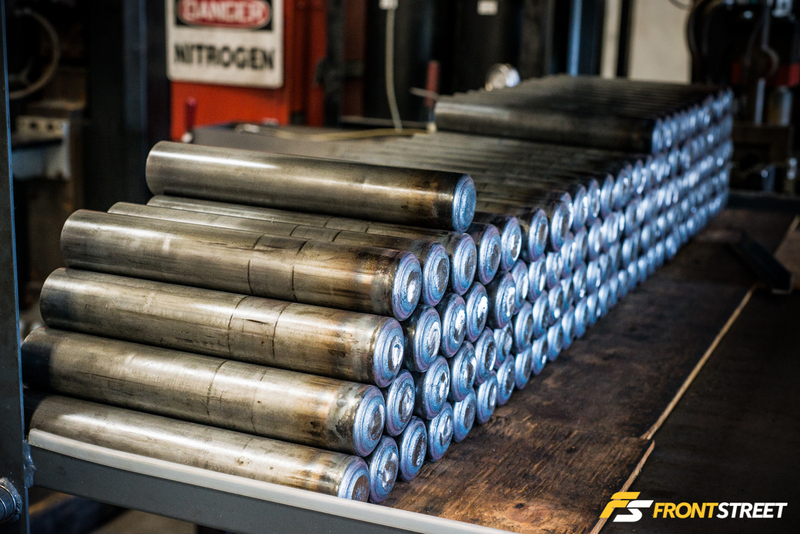 The amount of manufacturing, production, testing, research, and extreme quality control every piece goes through was mind-blowing. They’ve already established themselves as a leader in performance suspension, and will continue to grow massively with what I’ve seen. Hopefully you take away as much as I have.